my own and parts are stolen from other threads. running a MJ through a powered hub. may be able to get away with 384MB of ram (I didn't test that config). least 512mb or the OS and MJ software will not both fit. "attached phone wont dial" problem due to a previous install failure). b. Under "Standard CMOS Features" set the value for "Halt On" to "All, but keyboard". that this issue is peculiar to my unit and would not occur for everyone. e. Hit PF10 to save and exit to XP boot. Start->Shutdown->Logoff. This should bring up a login panel. Login as an admin with the id and pw given above. After reboot, log in again as administrator (see step 3). (if all is well, a red dot should appear in the lower right corner of the screen). auto-login panel. Enter the id and pw from step 3.
a. Click Start, click Run, type devmgmt.msc, and then click OK. The Device Manager window opens. b. Expand Universal Serial Bus controllers. d. Click the Power Management tab. f. Repeat steps c through e for each USB Root Hub in the list. h. Right click VIA Rhine II Fast Ethernet Adapter and select "Properties". i. Click the Power Management tab. k. On the Action menu, click Scan for hardware changes. l. Close the Device Manager window. launched for New USB hardware detected. 10 If you DONT see the wizard launched for a New USB hardware device detected, go to step 12. Navigate to the "USBAudio.Driver" folder created in step 8 and complete the driver install. First try a, if that doesnt work try b.
a. 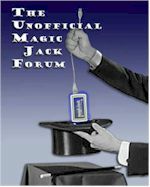 With the Magic Jack attached, Run Device Manager (Start>Run> type "devmgmt.msc" enter). You should see a yellow question mark "?" next to an entry like "Internet phone by TigerJet". Right click on that entry and select "update driver". Then go to step 11.
b1. Unplug the MagicJack from the 9450 and use Control Panel > "Add Remove Software"
b2. Back up the registry. If you dont know how, consult a PC geek or online resource. b3. Run "regedit" and do "Edit -> Find" to find all items matching "Magicjack"
Delete all items it finds (Use PF3 repeatedly to find the next item). can be deleted. (left click on item and select "permissions"). b4. Repeat the "Find" operation for "Tigerjet" and delete all items found. b5. Exit the Device Manager. When finished go to step 9.
and should come up ready to use. not already set to "telephone" you should be able to select the telephone button at this point. 14. Enable the write filter by clicking the round green circular icon on the desktop. This forces a reboot. automatically without having to press the yellow "On" button and without an attached keyboard. The HP instructions are stickied. It would be great if the same thing could be done for Wyse.